I'm a Minnesota Mom blogger, which means we're in the middle of our long winter season. It's actually been unseasonably warm for much of winter so far, but those of you who live in warm climates might cringe to hear that a “warm” winter temperature in Minnesota is 30 degrees! I'm not a lover of cold weather, but there are certain things I look forward to when the thermometer starts dropping. Wool sweaters, tall boots and scarves top my list, but I also get excited to turn my oven on feel free to spend afternoons baking bread, cookies and anything else I can think of for my family to enjoy! My husband is also Minnesota-born and bred, and he's really into the hearty comfort foods that many of us enjoy throughout the winter months. Give him a meaty dish complete with a warm, rich sauce and he's a happy man! Since I'm more into lighter fare, I sometimes have to go out of my way to remember my husband's favorite meals. I've tried satisfying my husband's cravings in previous years by buying him a few individual servings of cheaper frozen pot pies, but he confessed that they weren't exactly what he wanted. Since then, I'm pretty sure he's given up hope of having pot pie at home! 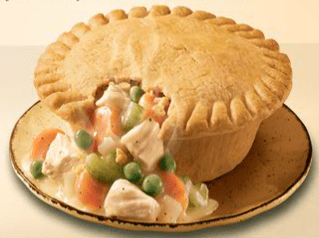 Did you see that there's a parmesan pot pie and a cheesy chicken variety, too! Two new pot pies with cheese were enough to get me excited to go to the grocery store and pick out a few for us to try! I really wanted to get both of the pot pies with cheese, but my store was sold out of the Cheesy Chicken variety. Instead, I came home with the Honey Roasted Chicken and Creamy Parmesan Pot Pies. They were priced at $2.59 each. Since prices vary from $2.10 to $2.99 in stores across the country, I thought that the average price my store was selling them at was acceptable considering the When I showed them to my husband, his eyes lit up and he asked if we could have them the next night for dinner! 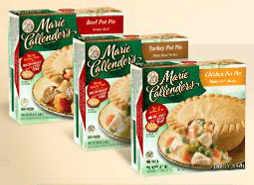 Another great thing about Marie Callender's pot pies is that they're made with no preservatives, eliminating unnecessary chemicals from this food. It's pretty rare to find frozen, packaged foods without those additives, so no preservatives makes me extra-happy! I was worried that the portion wouldn't be enough to satisfy my husband, but he said he was definitely full after eating his pot pie. I shared mine with my toddlers (along with fruit, cheese and a variety of other foods to make them happy!) and I was also satisfied after just part of the pie. I wanted to make sure that the crust cooked up crispy, so I baked them in our oven. They are, however, microwavable and can be ready in just minutes. They also come with a microwave-safe “crisping” tray to make the crust toasted and flaky. I'd definitely use the microwave cooking instructions instead of the oven if I needed to produce a great-tasting and satisfying meal on the fly! I wrote this review while participating in a campaign by The Motherhood on behalf of Marie Callender's Meals and received payment to thank me for taking the time to participate. I appreciate the full disclosure regarding your relationship to the supplier, however, with all due respect this post just reads to me like an advertisement, and I’m writing because this is not the type of post that I’d like to see more of; it doesn’t have value for me. But, no disrespect intended and please keep the other posts coming; thanks! Thanks for your message, Kirsten! I appreciate your feedback! There are various costs associated with keeping this site up and running, and opportunities like working with Marie Callender’s help me keep it afloat so I can share all those amazing baby deals with you and other readers. As you can probably tell from looking at the overall content of the site, I don’t do posts of this nature very often, since I want to remain focused on the true mission of my site. I like to think that I strike a more than comfortable balance between deals/ family-related posts and articles like the one above. I will always disclose when I’m paid to write about a brand or product. Please keep your comments coming, I truly welcome them! Agree with KM. This post was over the top.